In the 13 years since I first traveled to Africa, I have always resisted private lodges and safari guides. Mostly, because I’m cheap. But I’m also stubborn. I’ve always believed that you remember a lot better when you learn the hard way. When I stepped off the plane and into Cape Town’s airport, I didn’t know a thing about going on safari that I hadn’t learned from Marlin Perkins on Mutual of Omaha’s Wild Kingdom. In 1969. So I set out to learn, by driving across Southern Africa at reckless speed in a rented VW Polo. There was a steep learning curve. The 27 hours I spent digging myself out of a swamp using nothing but a sauce pan wasn’t even the worst of it. 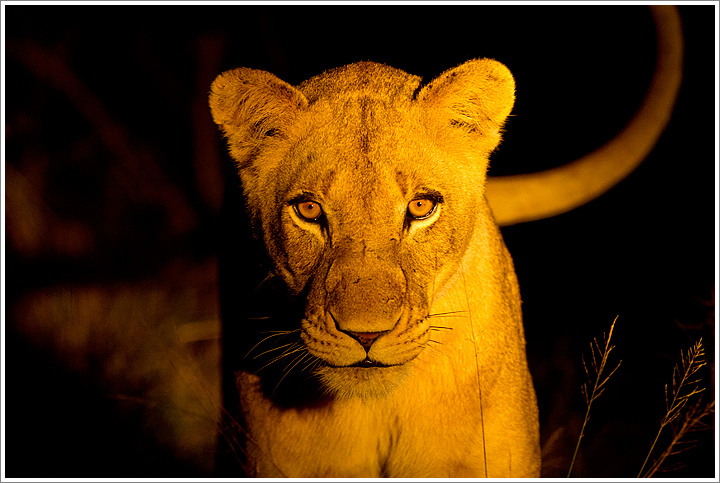 Which is a roundabout way of saying how delightful it was to enjoy a couple of (free) nights at Sabi Sands Game Reserve. Brilliant trackers and guides shared their encyclopedic knowledge during game drives where you actually spotted game, large and small. It slowly dawned on me that sometimes it pays to work with professionals. We stopped to photograph a pride of hunting lions, driving off road in the private reserve and working late into the night. And then we went back to camp, enjoyed a lovely meal under the southern stars and slept in a Hemingway-esque safari tent. Eating tinned curry and sleeping in the dirt will never be the same. This entry was posted on Tuesday, March 8th, 2011 at 10:46 pm. It is filed under On the Road and tagged with Africa, Lions, Safari, South Africa, Wildlife. You can follow any responses to this entry through the RSS 2.0 feed.